Organize project, subjects, notes and more in one convenient place. Eight interior pockets allow for detailed organization by enabling you to sort documents for one large project or use each pocket for smaller jobs. 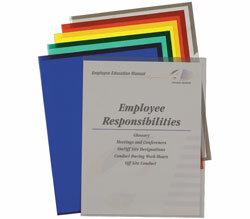 Features extra durable, rigid poly construction and attractive exterior finish for an overall professional look. Flap and elastic closure keeps materials protected while in transport. Elastic closure keeps flap in place while in use. Letter size. Cover is black outside with white interior.